The opportunities to wear what the best wear are few and far between. To be totally to the point, rarely would you want to. This gear is expensive, precise, and created to do one thing extremely well. If you aren’t using it for that purpose, you are spending a lot of money merely to look cool. However, for those of you who will put the high end gear to the use that it is designed for, it is more than worth it. One such item is the Bell Moto-9 Flex. It is a premium lid for ardent off-road riders. 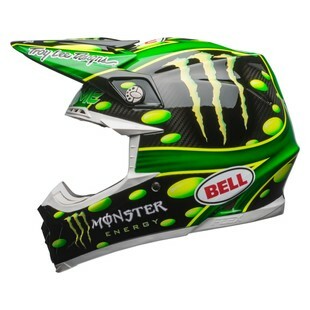 With the Bell Moto-9 Flex MC Monster Replica 2018 Helmet, you can even rock a pro-level graphic just as if Monster was your very own sponsor. In looking at what makes the Moto-9 Felx MC Monster Replica Helmet so special, you have to look past the graphic, however. Everything on this helmet, from the lightweight composite carbon shell to the adaptive fit segmented construction of the interior has been thoroughly researched, designed, and crafted to be the best. Additional features of the Moto-9 Flex include a fully adjustable flying bridge visor, exclusive Magnefusion emergency removal system, and both Snell M2015 and DOT safety certifications. So, if you dabble in dirt (and are not a billionaire), then this helmet is not for you. If you are tearing through trails and pinning the throttle on a regular basis, however, the Moto-9 Flex Monster Replica might be right in your lane.